Cyber Monday became a popular custom in the US when retailers began offering their best deals of the year online on the Monday after Thanksgiving weekend. Cyber Monday’s biggest difference from the traditional Black Friday shopping day is that online shoppers don’t have to wait in lines outside of a store and literally fight others to get a product they want. Instead, shoppers can enjoy great deals without the crowds and without leaving the comfort of their own homes or offices. This year Amazon will offer what they are touting as “tens of thousands” of deals between now and December 22nd. 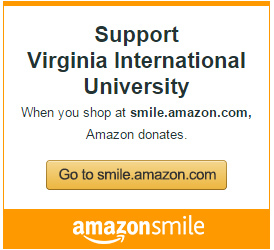 You can take advantage of the best online deals with Amazon and support Virginia International University without spending extra money if you sign in with AmazonSmile. AmazonSmile is an easy way for you to support VIU when you shop online, and it costs you nothing above the cost of the item you purchase. When you shop at smile.amazon.com, you’ll find the same selection and pricing that is on Amazon.com, but a portion of the purchase price will be donated to VIU by Amazon. You can use your regular Amazon.com account to login to AmazonSmile, and all of your existing wish lists, registries, and other settings will be there for you. Which products on AmazonSmile are eligible for donations to VIU? Most products are AmazonSmile eligible, but a few are not. Look for “Eligible for AmazonSmile donation” on the product detail page to verify eligibility. How do I designate VIU as the donation recipient? On your first visit to AmazonSmile (smile.amazon.com), you will be asked to select the charitable organization that you want to receive donations. Just select VIU. After that, AmazonSmile will remember your selection, and every eligible purchase you make at smile.amazon.com will result in a donation to VIU. How much will AmazonSmile donate to VIU? The AmazonSmile Foundation will donate 0.5% of the purchase price from your eligible AmazonSmile purchases. The purchase price is the amount paid for the item minus any rebates and excluding shipping & handling, gift-wrapping fees, taxes, or service charges. From time to time, AmazonSmile may offer special, limited time promotions that increase the donation amount on some products. Do I receive a tax deduction for the donation VIU receives? Interested in making a tax-deductible donate directly to VIU? See the Support VIU webpage.